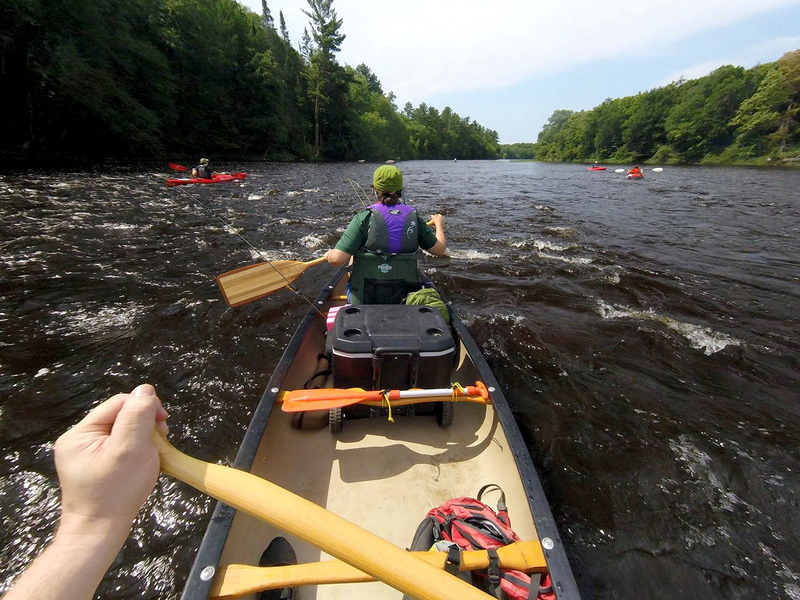 The north fork of the Flambeau River is famed for its beauty, abundant wildlife and trips that offer varying degrees of difficulty from flatwater to Class II whitewater. The Nine Mile to Dix Dox trip is the most popular section of the north fork, with alternating playful Class I whitewater and flatwater stretches. It’s also perfect for smallmouth and musky fishing. When water levels are sufficient but not dangerously high, a paddler will see numerous McKenzie dory drift boats with anglers throwing big flies toward the shore hoping for big fish. Gauge notes: There is no gauge on this section. There is a boulder next to the gravel landing that is used as a gauge. On this day, the water level was about six inches below the top of the boulder. If you cannot see the boulder, that would be considered high water. Call 9 Mile Tavern (near the put-in) at (715) 762-3174 for updated river levels. Levels are controlled by the Crowley Dam, three miles upstream from the put-in. This was a perfect level – rapids and riffles were fun but not too technical. We ran this trip last year and the aforementioned boulder was two inches underwater, which meant that the rapids and riffles were mostly nonexistent and less interesting. Lower levels make the rapids and riffles more technical and result in more scraping in shallow water. Wildlife: A couple eagles, one deer, bass and one giant sturgeon spotted. This trip has something for just about everyone. On this day, the water levels were perfect, the weather was gorgeous (80 degrees under sunny skies with a few wispy clouds), the fish were biting and everyone successfully negotiated the tastes of whitewater this section offers. Waters levels were sufficient to make Barnaby Rapids and the other Class I riffles and rapids a little less technical but still fun enough to satiate those in our group that prefer whitewater paddling. There was also enough current that the flatwater stretches moved fairly quickly but still allowed us to chat and fish our way down the river, which three of the nine people in our group spent time doing (and we all landed (or lost) a few smallmouth bass along the way). The highlight of the day for two of us was seeing a 60 inch sturgeon near the shoreline. None of us had ever seen one in the wild before, so that was exceptionally special. Another great feature of this trip is the short shuttle route. You get to paddle almost twelve miles with a short six mile shuttle. Also, both the put-in and take-out on this stretch are excellent – each location equipped with water pumps, pit toilets, and DNR info stations that include mesh trash bags you can borrow while on the water. 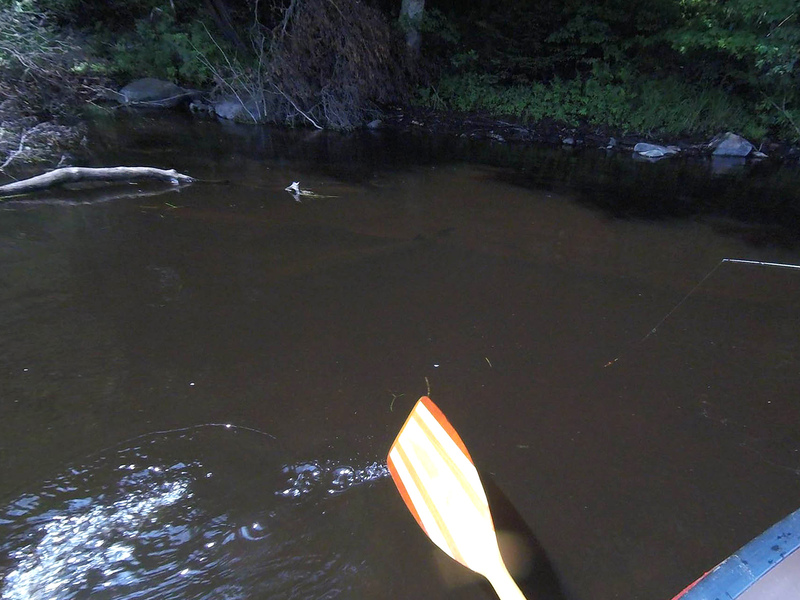 The launch at Nine Mile (or Ninemile, 9 Mile, 9-Mile, etc – seems to be a discrepancy as to the spelling) Landing is usually in a small pocket of slack water, but as soon as you push out into the current, you get your first taste of Flambeau River paddling. A swift riffle with a few small boulders to dodge spills out into the first flat, deep section on this stretch. At this point, you get a chance to begin admiring the coniferous forest mixed with birch and other trees that lines the banks throughout most of this section. There are some marshy areas along the margins that give way to reeds, cattails and the occasional stand of arrowheads. This mile of flatwater dotted with large boulders eventually gives way to the first class I riffles on the stretch. A short flatwater stretch follows before you begin Barnaby Rapids, the only named rapids on this section. On this day, Barnaby provided the usual fun, with plenty of routes around the numerous boulders giving way to nice wave trains to follow. Once Barnaby spills you out into the next section of flatwater, you alternate flatwater and Class I riffles a couple more times. Just before reaching an area known as Dead Man’s Slough, the water relaxes into its character for the rest of the journey. The remainder of the paddle consists of flatwater dotted with boulders and periodic strainers along the shoreline. This is where the fly fishing outfitters make their money. The current is still swift, and there are a couple spots that will be a little riffly in low water. Dead Man’s Slough has a solid gravel landing at which paddlers can get out to take a break for stretching and nature seeking. Be careful, as this is one spot where the mosquitos might carry you off! Your next chance for a break is at the County Line Canoe Campground, which is almost exactly the midpoint of this section on river-left. There’s a pit toilet connected to the three campsites at this location. Like nearly every other canoe campsite along the Flambeau, the campsites are connected by a central fire ring and picnic table. This is our usual lunch spot for this trip. In higher water though, this can be a challenge to land a sizable floatilla of boats due to lack of space and swift current. On this day, the landing was just fine. The beautiful alder marshes become more frequent as you make your way further downstream, with the overall depth of the water gradually increasing. So if you do want to get out at places other than landings, wade carefully. The riverbed itself varies from large rocks and boulders to smaller rocks, gravel and occasional sand. After going mostly north downstream of County Line, you eventually make the turn to head mostly due south. The Oxbo Canoe Campsite awaits a mile downstream from that turn. A couple more miles of lazy flatwater studded with boulders and the occasional shoreline riffle lead you to the excellent river left boat ramp at Dix Dox Landing. When you see the ATV bridge, you know you’re in the home stretch. If you reach that bridge and hear the next pitch of rapids, you’ve gone too far! While you’re in the area, if you want a solid place to grab dinner, stop in to A.J.’s Bar & Dining in Park Falls. They have a reasonably priced seafood buffet on Friday night that includes soup, salad bar and non-seafood items like potatoes, baked chicken, and corn on the cob. Their Saturday night prime rib is excellent as well. For dessert, head on up to Butternut Ice Cream and Treats in Butternut. Their made-on-site waffle cones are a delicious delivery system for some excellent ice cream. Next time we go, we will try some of their sandwiches which also looked delicious. The only thing that was remotely unpleasant on this day were the mosquitos at our lunch stop at the County Line Canoe Campsite. Direct sunlight was not enough to keep them at bay. One of the folks in our group cut the weekend short due to his back getting bitten up while eating lunch. That makes two years in a row the mosquitos were bad at that location, but in all other previous trips we never had much of a problem. I do this trip every year on roughly the same weekend, so I have experienced differing water levels and other conditions. Really the only important variable is water levels in the week or two leading up to and during the trip. Mosquitos are the main issue when it has been wet in recent weeks, and you just want to make sure you have sufficient water to avoid a lot of scraping in the riffles and rapids. Eventually I want to spend a much longer day on this section and take my time fishing it. I spent more time fishing on this trip than in any past trip on this section, but I was still steering our canoe for half the day.